That’s the ATX Radiant Barrier & Insulation Guarantee! On a particularly hot day, an Austin roof can get extremely hot – up to 150-180 degrees. But that’s just one of your concerns. You see, the hotter your roof gets, the warmer it becomes inside your home and the harder it needs for your air conditioning unit to work to keep your interior comfortably cool. This in turn shortens the life of your AC unit and may force you to replace it prematurely. This naturally results in more energy consumption, which translates to higher electricity bills. Also, your home’s interior becomes more uncomfortable because of the humidity. When your home is properly insulated, the insulation and the air conditioner compliment each other in that they work with each other instead of against. The insulation keeps the air in your attic cooler so when the air conditioner sends cold air through the duct work in your attic to your home, it remains cool without heating up, thus causing the AC unit to work more efficiently. To lower your electricity bill, you need to effectively reduce the amount of heat that enters into your home. The cooler your home gets, the lesser energy you will need. One of the most efficient ways of doing it is with the right roofing and attic fiberglass insulation. Without proper insulation, your home could end up getting uncomfortably warm during the hot summer months, making you spend hundreds of dollars on electricity. In the winter, the same happens in the opposite result, heat escapes and forces you to have that heater on more than is necessary. With proper attic insulation, there’s no need for you to spend more than you should on electricity. Those savings go back in your pocket. Let’s face it, you know how to spend your money better than the electric company! Put that savings back in your home for something better like a family vacation! Blown in attic fiberglass insulation is a breakthrough insulating system. It works by creating millions of air pockets that slows down the transfer of heat. This allows your home to stay cooler during the warm months and warmer during the cold season. This also translates to lesser work for your air conditioning system, allowing you to save as much as 17% or even more on your yearly cooling costs. Another advantage that blown in attic insulation brings for Austin property owners is that it doesn’t require you to tear apart parts of your home during installation. It can simply be put on top of your existing insulation adding to the R-Factor of your home, or it can replace your old worn out insulation. We provide an insulation removal service as well. Either way you choose, ATX Radiant Barrier & Insulation has your concerns well taken care of. However, let’s face the fact that not all homeowners are willing to shell out money on attic insulation. That’s where we come in to help. 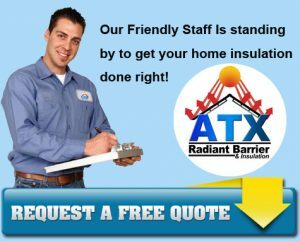 At ATX Radiant Barrier & Insulation, we take pride in offering affordable, turn-key insulation products for Austin property owners that focuses on reliability and quality. Hassle-free installation – With our breakthrough blown in fiberglass attic insulation solution, there no longer any need to tear down any part of your home. And installation will only take a couple of hours. Water proof – One of your attic’s enemies is humidity. With our fiberglass blown in insulation, you don’t have to worry about moisture. Your attic will remain dry and efficient. Durability – Set it and forget it. That’s our guarantee. Our blown in attic insulation solution can last for up to 15 years without maintenance. Affordable – Our blown-in attic insulation has R-values as high as 20-36, yet it is one of the most affordable compared to the other kinds of attic insulation solutions. Resistant to mildew and mold – Because we only use high quality moisture-resistant materials, you won’t have to worry about mildew and mold. Lower cooling costs – Our guarantee includes lowering your energy costs. We can help you save your energy consumption with our products by up to 17%. Comfort – Have a living space in your home that has unparalleled comfort with the absence of humidity and dank atmosphere. We are the leading Austin Attic Insulation Company because of our customer satisfaction with our products and services. Without you, we have no reputation. So we will do our very best to see that every customer is completely satisfied with the service, the product, AND the results! To find out more about our reliable and high quality blown in attic insulation solutions, contact us today. ATX Radiant Barrier & Insulation has your needs covered. You can rely on your professional service to give that energy-efficiency that you need for your home. Talk to us today for a free on-site assessment.